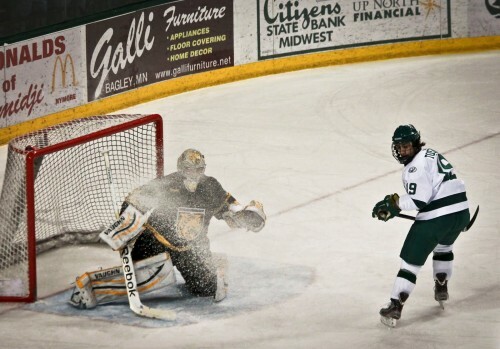 The Bemidji State men’s hockey team swept No.10 Colorado College last weekend at the Sanford Center. With the two wins, BSU is now 5-6 against nationally ranked opponents. Junior forward Aaron McLeod got the Beavers on the board first on Friday with a goal in the first period. The Tigers dominated the second period by scoring two goals to take a 2-1 lead heading to the third period. The Beavers came roaring back as they scored three goals in the third period to pick up a 4-2 win. Junior forward Brance Orban scored two of the goals to give him seven on the season. Freshman forward Tyler Tosunian scored the first goal of his collegiate career to give BSU a 3-2 lead with 9:49 left in the game. Senior goaltender Dan Bakala made 29 saves for the Beavers in the win. Joe Howe, of Colorado College (15-11-2 12-9-1 WCHA), turned away 23 shots on the night. On Saturday, it was the Tigers to score first as Andrew Hamburg scored his first goal of the season with just 48 seconds remaining in the period. The goal allowed was Bakala’s only miscue on the night. He made 23 saves. Junior forward Jordan George answered by scoring his 15th goal of the season in the first 30 seconds of the second period. McLeod was credited with his 10th assist of the season on the goal. Ten minutes later, the Beavers capitalized on a power play with a goal from senior forward Shea Walters. The goal gives Walters ten on the season. The Beavers out-shot the Tigers 18-3 in the second period. Just as George did in the second period, McLeod scored in the first 30 seconds of the third period to give BSU a two-goal cushion. With the two goals on the weekend, McLeod now has eight on the season. Freshman forward Danny Mattson picked up his third goal of the season to help secure a 4-1 win for the Beavers. Despite only making one save in the third period, Howe stopped 26 shots on the night. Junior forward Ben Kinne picked up two assists in the victory. 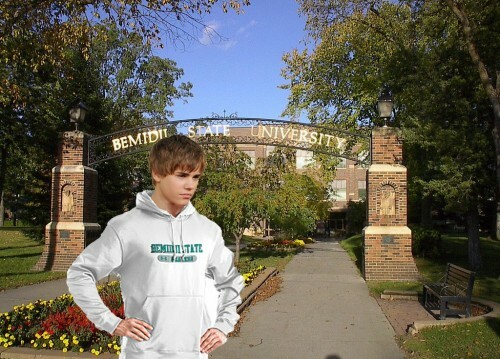 Bemidji State (15-12-3 9-10-3) will travel down to the Twin Cities to take on No.2 Minnesota this weekend.